Let me begin by saying, I’m a total Myles fangirl. I have always LOVED her books….until now. I was hesitant to jump in mid-series, but it appeared to be a safe move since the focus is on a new couple. I don’t think my problems had anything to do with lack of history from the first two books. And I had no problem with the writing. I’m not a fan of cheater-cheater-can’t-keep-it-in-your-pants-assholes. And not only was Grant screwing around on his wife in the last book, but now he’s going through a divorce..and we get to witness it. *cringes* I believe I would have had an inkling that Grant was cheating on his wife if I had read the previous book, so maybe it is ‘shame on me’. This is exactly why I avoid out of sequence series reading. Tearful conversations with his soon-to-be ex and coming out to his kids….those were scenes full of tension. I struggled with them. I didn’t want to listen to his wife’s broken sobs or the bitterness when it came to their children in the separation. Not only did that turn me off but Grant is a complete douchebag when it comes to Dare. He’s snobby, rude, and lacks all manners. I found it very difficult to ‘like’ him, let alone wish him upon Dare. I craved more tenderness or more humor. For as much stress and pain that was present, there was very little comic relief. A bit of laughter would have eased the tightness I felt while reading. I adored the slang though…tickled my fancy. Jo sprinkles British flare into her writing that keeps me coming back for more and this strike-out on my end certainly won’t deter me from more in the future. Quite possibly it could be classified as a me-not-you issue. Infidelity turns my stomach and almost makes me nauseous when children are involved. And I wish I could have forgiven him, but as it turns out he is merely separated from his wife throughout the entire book. I’m not sure when the divorce goes through, but they were still married during his relationship with Dare. Grrrrrrr, this was another kick in the shins. This may not be a button pusher for you, but it was a doozie for me. Since Grant irritates me so, I think I shall skip ahead to Dare. Dare is a carefree, simple and hard-working guy. He had a tough childhood and to be fair, his adult years haven’t been much easier. His father left him their family home and his junkyard when he passed. His younger brother became a victim of the deadly clutches of drugs. Heroin is slowly destroying Jace and Dare can’t save him….his last remaining family member is fading away before his eyes. There are some especially difficult scenes with Dare and his junkie brother. I wanted Dare to be happy, he deserves to be happy. I loved his rough and tough exterior and adored his marshmallow center. When he loves someone, he loves with fierce intensity. Even his pup, Solly, is lucky enough to be on the receiving end of his loyal affection. Another niggle I had was the battle-of-the-tops. Both Grant and Dare are bossy tops and obviously this presents a problem. They finally figure it out and yowza, it ends up being smokin’…but it was a titch annoying at first. It was as if we were shown again and again why they didn’t fit or were simply wrong for each other. No matter how hard you try, a square peg does not fit into the circular slot. I appreciate the man Grant became, but wanted to smack the man he was before turning over his new leaf. I applaud how Dare handled every sticky situation he was tossed into. And how about that ending? It left me hopeful. I wish I could have loved it…I wanted to love it…but I was grasping at strings to hold on. If you are familiar with and have enjoyed The Bristol Collection, I imagine you will love this one too. 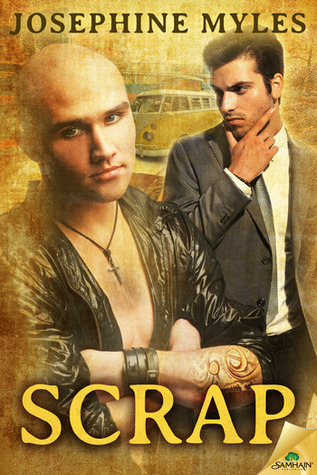 Looking forward to reading Scrap! This entry was posted on March 12, 2015 by Sheri in Contemporary, Reviewer: Sheri and tagged 3 Stars, josephine myles, samhain.